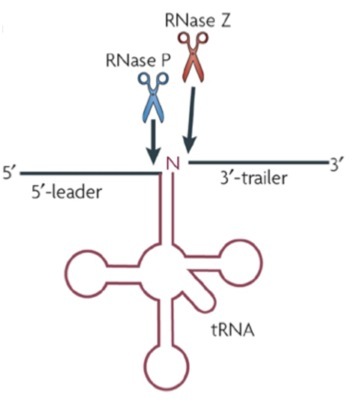 tRNA processing from a primary transcript by RNAse Z and P.
Producing multiple sgRNAs from a single RNA polymerase II (Pol II) – transcript would enable multiplexed mutagenesis and gene editing as well as the possibility of precisely regulating the expression of sgRNAs in specific temporal and spatial patterns. 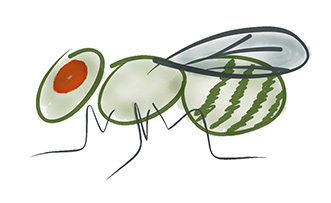 Port and Bullock (2016) describe a system to just that that was developed in Drosophila melanogaster but which is directly portable to other insect systems. The innovation reported by Port and Bullock (2016) owes much to some earlier work of Xie et al (2015) in which multiple sgRNAs could be produced from a single transcript by flanking each sgRNA with a tRNA sequence. Natural processing of the tRNAs by RNAases P and Z simultaneously release the tRNAs and intact sgRNAs that can be loaded into Cas9. The tRNA-sgRNA containing transcripts can be expressed from Pol II promoters and consequently one can then incorporate temporal and spatial constraints into experimental designs aiming to use Cas9 mutagenesis as a way to silence specific gene expression – as, say, an alternative to tissue and developmental gene silencing using short hairpin containing transgenes. Port and Bullock (2016) worked with tRNA-sgRNA transcripts containing 4 sgRNAs and showed that the efficacy of a given sgRNA was independent of its position in the array of four sgRNAs. It did not matter if it was the first or the last sgRNA, the frequency of mutants was not affected. The authors demonstrate how one might use this system in combination with the Gal4/UAS system to silence by mutagenesis a gene of interest in specific temporal and spatial patterns. While this application is readily available for D. melanogaster , it is increasingly available for other insect system such as silkworms, Tribolium and various mosquito species. Port and Bullock (2016) report some other observations that are interesting and worth considering by anyone intending to use RNA-guided endonucleases in vivo. First, the authors reported previously that expressing high levels of Cas9 in Drosophila using the Gal4/UAS system resulted in toxicity. This toxicity was not caused by the endonuclease activity of the protein. Here they report creating a new UAS-Cas9 construct (pUAS-Cas9.P2) that resulted in lower levels of protein expression and almost no discernable toxicity. A second observation was that Cpf1, another RNA-guided endonuclease that has been reported as not only being effective in mammalian cells but also as having different targeting requirements (PAMs), did not perform as well in Drosophila compared to Cas9. In vivo expression of Cas9 and its various derivatives for the purposes of mutating genes, up or down regulating gene expression or remodeling epigenetic marks will benefit from our abilities to express sgRNAs in precisely regulated patterns and Port and Bullock’s work are worth taking a look at if you are interested in these sorts of applications. The reagents described by the authors either are available or will be shortly (Addgene). Simon Bullock, PhD. ; Cell Biology Division, MRC Laboratory of Molecular Biology, Cambridge, UK.